At a certain age, one starts to realize that their loved ones won't be around forever. It's a hard pill to swallow, and a lesson you can't un-learn. But how does one stop time? 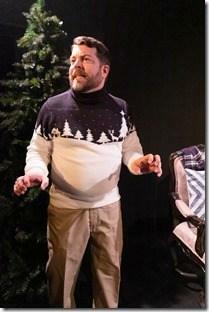 Can we keep the holidays perfect, frozen in time, a virtual snow globe? 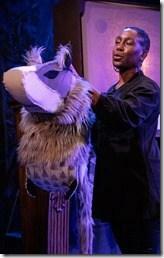 Otherworld Theatre is a relatively new Chicago company, focusing on science fiction and fantasy-focused storytelling. 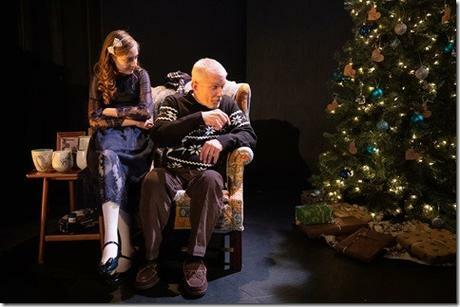 The Winter Wolf is their holiday world premiere, an intimate female-driven fairy tale about granddaughters, grandfathers and the quest to keep Christmas wonderful. Directed by artistic associate Lauren N. Fields, Joseph Zettelmaier's script is a bit slow at times, and the puppetry slightly underwhelming. 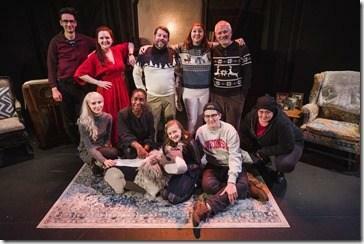 Overall, however, The Winter Wolf is a pleasant and touching world premiere for those craving something new. 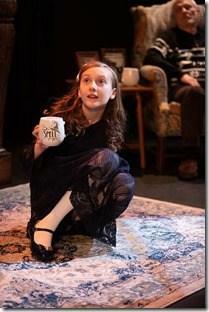 Cora (Molly Southgate) is a precocious preteen - are there any other kind in pop culture? - who is very close to her grandfather (Mike Rogalski). Sadly, dear old grandpa's health is failing and the end seems nigh. When Grandpa tells Cora a story from his childhood of a powerful, magical Winter Wolf (Shariba Rivers), Cora sees an opportunity to keep her favorite family member around forever. But what is the price of stopping time? At its core, Zettelmaier's script has the dark-yet-uplifting predictability of all fairy tales - but come holidays, that's not a bad thing. Why do people stream Hallmark Original Movies, make yearly pilgrimages to and ? At the holidays, we want routine and a happy ending. We crave it. Sure, a little sadness and tragedy is acceptable, but especially as the world around us grows more chaotic, we count on satisfying and hopeful resolutions wrapped in a pretty bow. 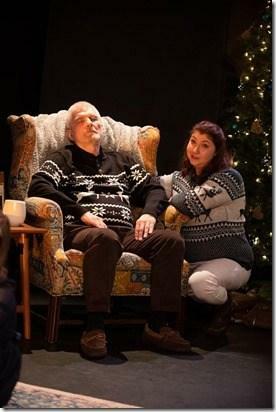 The Winter Wolf delivers this: when stepping into the theater, audience members are greeted by the fresh scent of pine needles, and Cora's mother (Katy Crow) and father (Nathan Pease), who cheerfully offer cookies and hot cocoa while bedecked in Christmas sweaters. 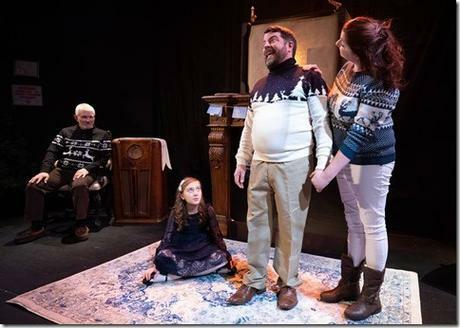 The atmosphere is lovely and welcoming, setting the tone for the short, family-friendly parable ahead, and Fields engineers it to the hilt, while maintaining the script's genuine feel. Though the play clocks in at only 70 minutes, the second half - where Cora gets her wish and then has to live with the consequences - drags, and could benefit from quicker pacing. Though most of The Winter Wolf 's effects are thoughtful and lovely, especially lighting that lovingly recalls fire by the hearth, ominous power outages and sweet shadowboxes, the wolf puppet itself isn't much to write home about. Rivers is an incredible wolf, with a rich speaking voice that projects both intimidation and compassion, but Janie Killips' puppet projects none of this and appears as a glorified stuffed animal. The Winter Wolf is presumably meant to be suitable for children, but even the smallest kids can handle a bit more fright. 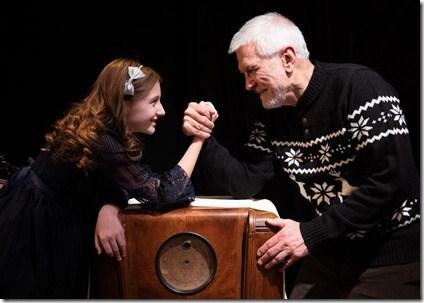 Fields has cast four capable actors, and the three adults project warmth and compassion, especially Rogalski as Cora's snappy but kind grandfather. As the child Cora, Southgate is polished and adorable - and has worked with Otherworld previously - but struggles with Cora's more emotional moments. Could be opening-night nerves, but Cora's realization that her wish to stop time has negatively affected everyone around her, felt more put-upon than natural. Perhaps this will come with time. 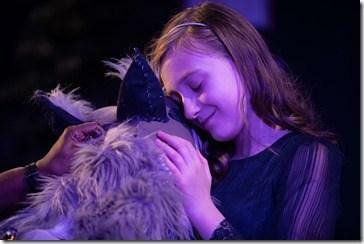 Despite these flaws, The Winter Wolf never feels forced or manipulative. Instead, the original story, beautifully directed, designed and acted, has the potential to be a holiday tradition for Otherworld in the years ahead. Step right up.